Your home protects you from the elements but you have to protect it a little too. Spring is upon us and it might be time to start thinking about cleaning up the outside of your house. A little maintenance can help keep your home looking great and make it last a long time. Fortunately, cleaning the outside of your home is easier than you might think. With just a little time and the right tool you can have your home looking ready for company. How to Clean Wood Siding – Bob Vila Think your wood siding needs a fresh coat of paint? Maybe. Or it could be that your wood clapboard, lap, or shingle siding simply needs a thorough cleaning. Homeowners have always prized wood for its unparalleled appearance, but like any siding material, it requires periodic maintenance. With wood in particular, the challenge is to avoid doing more harm than good. 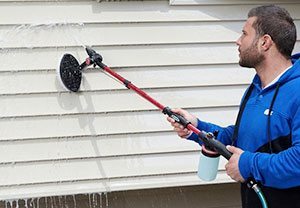 For instance, you might be tempted to clean wood siding with a pressure washer, thinking it would make quick work of things. Do so at your own risk. Using such a high-powered tool can actually cause several types of damage, including stripped paint, gouged boards, and loosened caulk. Plus, if the pressure washer manages to send water through the joints and behind the boards, the errant moisture could end up fostering mold growth or triggering wood rot. In short, unless you’re deeply familiar with the operation of a pressure washer, don’t point one at the most visible part of your home. At JNT Developers we know you take pride in your home. That’s why we take pride in being your favorite Dallas roofer. We want to take care of your home as if it were our own. If you need help with anything or have any questions give us a call!